This project is to create an edited book with the working title Social Adaptation to Climate Change in Developing Countries: Development as Usual is Not Enough. The book will comprise around ten substantial chapters focusing on how social dimensions such as gender, marginalized groups, power, institutions are central for understanding vulnerability to climate change in developing countries. It sees social dimensions in relation to successful and less successful adaptation and development projects to provide lessons for how such social dimensions must be taken into account when designing such interventions, since they can limit or facilitate the capacity to adapt to these changes in order to reduce vulnerabilities. Consistent through this edited book is the focus on social dimensions, and how they can be relevant for handling issues of climate change vulnerabilities. 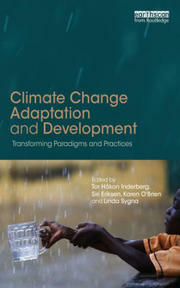 The book asks in its introductory and concluding chapters whether there is a need for social transformation in order to meet the challenges posed by climate change in its various forms.